In her later years, my wife’s grandmother suffered from dementia. She was the same extraordinarily sweet, wonderful person she always had always been, but her short-term memory faded and her filter disappeared. For a time she lived with my wife’s family. Their formal dining room became her bedroom — it was easy to keep tabs on her from the adjacent kitchen. She would go to her room to watch the TV news, and as my wife did her homework in the kitchen, she could hear Nana talking to the news anchor or reporter as she watched. “That’s not your real hair…. That cannot be your real hair…. That’s gotta be a wig…. That can’t be your real hair….” <pause, when apparently a new person appeared on screen> “Boy, you are fat…. You are really fat…. Fat, fat, fat….” <pause> “That’s not your real hair…. That cannot be your real hair….” And so it went. Not hearing a single word of what the anchor was saying. I couldn’t help but to think of Nana when watching Mayor Duggan’s speech. 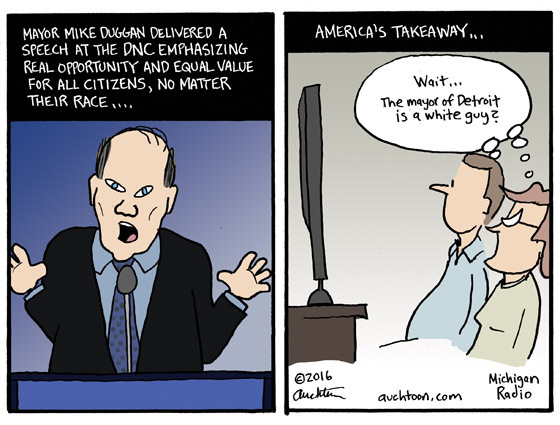 Folks outside of Michigan (and many within) probably would have guessed that the mayor of Detroit was a black guy named Kwame McColeman or something and got stuck on the fact that Duggan is white (completely missing the point of his speech). But if you listened to the speech I think Duggan is on the right track. The most important thing is to keep the conversation open so that all can be heard. Set goals where “everyone will be equally valued and everyone will have real opportunity,” but realize that it’s a process. And maybe one day when all of our filters have disappeared, we will be focused on Duggan being a pudgy bald guy and not the color of his skin. I’ve worked in the business world for quite some time now. From private to public companies, startups to established corporations, employee to contractor. I even had my own company for a dozen years. So I think I have a fairly broad understanding. Still, I’ve never really bought into the idea that being a successful business person necessarily will make you a good public servant. Sure, things like the desire to be in charge, being a good steward of resources, knowing when to inspire and when to delegate — those are going to be helpful whether you’re CEO or governor. But functionally, the two jobs are very different animals. An elected leader needs to embrace the integrity of a purposely restricted system (laws); private business owners are ultimately only responsible to themselves. It scares me when those promoting the idea don’t seem to be aware of the differences (or willfully ignore them). Ironically, many of Donald Trump’s standard business practices align more readily with the worst behaviors of a government bureaucrat: reneging on deals, aggressive deficit spending, opaque and authoritarian rule. 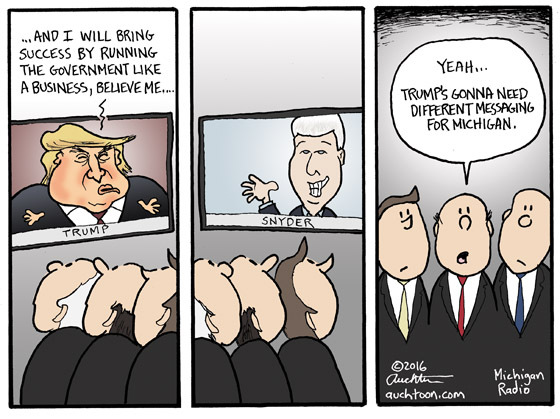 I just don’t see how “I will run the government like a business” would be an easy sell to Michigan voters. Especially when Governor Snyder already seems to have, um, poisoned those waters. A cop shoots a man dead. Is your first thought to want to know their racial profiles? A man uses a military assault rifle to kill multiple people. Is your first thought to hope for a reason that won’t conflict with your political views? A neighborhood teen takes his own life with a handgun. Is your first thought to wonder why a handgun was available to him at a moment of despair? A young woman is gunned down in Chicago. Is your first thought to consider how this might affect gun control statistics? A homeowner uses a gun to kill somebody on his property. Is your first thought to feel gratification for justice served? A little girl finds a loaded gun in her house and shoots her younger sibling. Is your first thought to ask whether the gun was legal? Do you see where I’m going with this? When your life intersects with stories of guns and death, is your first instinct to align the news with your politics? Or is it to consider the loss of human life? It’s the politics, right? Me, too. But maybe making the loss of life our first thought would be a real starting point for reducing gun violence. Last month, Rick DeVos complained aloud via Twitter that the state flag of Michigan was “ugly” and “non-useful.” Well, sharing needlessly judgmental observations is what Twitter is for, so we likely would have all moved quickly on to the next snark if DeVos wasn’t (a) the founder of ArtPrize and (b) offering $500 to the best three redesigns. At the time I was going to do a cartoon with three of my own submissions. But as is often the case, a different idea came along and overtook it. I figured this one had missed its opportunity. However… that absolutely gorgeous, thoroughly enjoyable Independence Day weekend messed me up. 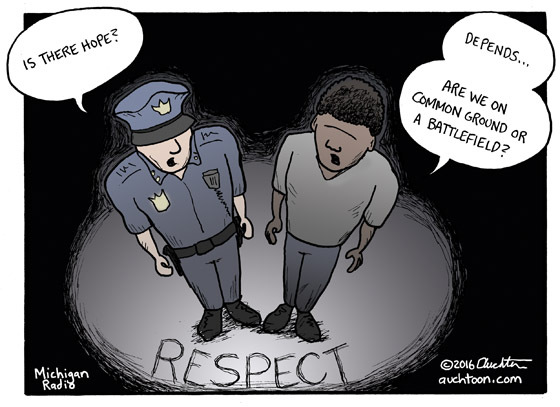 I found myself happy, refreshed, and generally pleased with life, which is like kryptonite for editorial cartooning. From the void of my contentment, the flag idea resurfaced. When I realized that the winners have not yet been announced, I thought it might still have a chance. I didn’t want to do the three submissions thing, though — that definitely seemed past its freshness date. 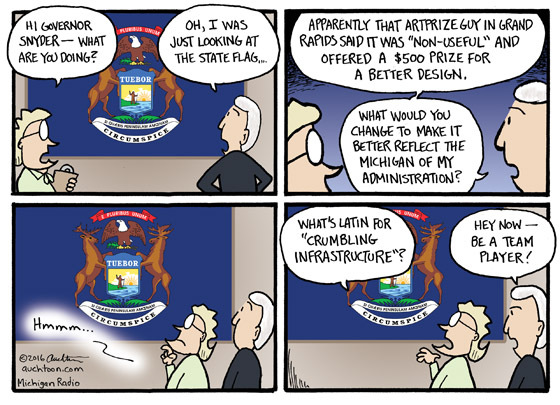 The strongest gag idea I had was the “what’s Latin for ‘crumbling infrastructure’?” bit. (The second best: “If you seek a perilous pothole, look around you.”) With the theme established, I was inclined to bring in our Governor Snyder and have an underling take a jab at him for his abysmal performance on infrastructure issues. A quick reflection on the money my family sinks into car repair every year because of said infrastructure issues, and I was no longer happy (and therefore ready to draw). As for the current flag — yes, it is a design mess with its mishmash of odd choices and conflicting ideas, but it also has a unique beauty. I think that’s a pretty good description of Michigan. 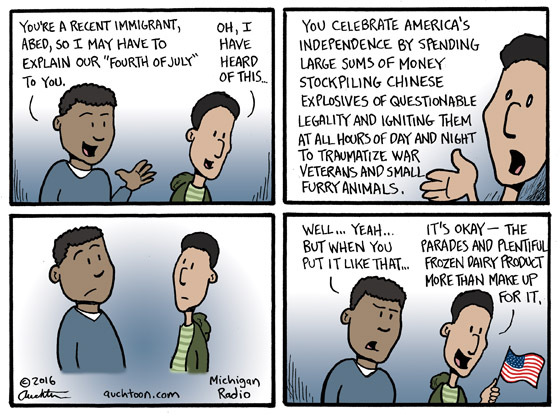 I was trying to work up some righteous indignation about Michigan’s fireworks laws and the decision in 2011 to allow in-state sales of the loud, semi-dangerous variety. Maybe it was being awoken at 1:00AM Tuesday by somebody’s sudden need to express their patriotism very close to my bedroom window. Maybe it’s the messes left in the park and cemetery next to my house by people who apparently don’t like to explode things on their own property. Maybe I’ve begun my official decent into grumpy old manhood. I dunno. It’s hard to tell — I’m still kinda sleep deprived. Whatever the case, I couldn’t seem to sustain a good righteousness or indignation. Truth is, I’ve done my fair share of setting off “Chinese explosives of questionable legality.” Not recently, but certainly in younger days. (I bonded with my eventual brothers-in-law by repeatedly strapping a hapless plastic army soldier we called Fritz to bottle rockets.) And fireworks are only the surface of a very deep pile of stupid things I’ve done. I think that’s the thought that stopped me: We live in a free country, but freedom doesn’t necessarily align with smart. So I wish you all a happy and safe Independence Day! We are all free to decide our own level of stupid (but let’s try to keep it to a minimum).